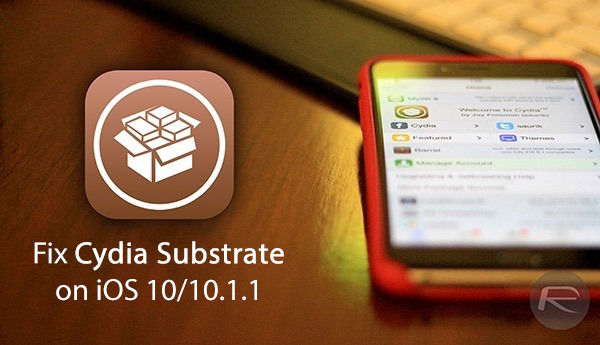 Here’s a step-by-step guide on how to fix and enable Cydia Substrate on iOS 10 / 10.1.1 jailbreak on compatible iPhone and iPad devices. Before we begin, it’s important to note that this is an unofficial fix released by Ijapija00 and can cause issues on your device. In worst case scenario, it can even brick a device. If you are not an advanced user, we don’t recommend installing it. After all, Substrate is disabled at this point in time for a reason. Wait for the official fix from Luca in future version of Yalu jailbreak. With that out of the day, for developers and advance users, here’s how to fix and enable Cydia Substrate after iOS 10 jailbreak. Step 1: First up, you’re actually going to need to have a jailbroken device to be able to take any benefit from this. With that in mind, you’ll need to run through the process of jailbreaking your iOS device using the latest ‘mach_portal + Yalu’ app. You can view our previous guide on that process here: How To Jailbreak iOS 10 / 10.1.1 With Mach_Portal + Yalu [Tutorial]. Step 2: With the device jailbroken, it’s now time to head into Cydia. What we actually want to do here is add a new source to the Cydia list of repositories so that we can access a package that otherwise wouldn’t be available. To that end, when in Cydia, head to the Sources tab and add the following new source: 83.218.67.215/~ijapija00/cydia. Step 3: When the source has been added, and packages have been refreshed, you’ll now need to search for the package required. Either use the search functionality or drill down into the actual repository itself to look for “Substrate Fix (iOS 1o)”. Step 4: Install the above package just like you would with any other package or extension via Cydia. Wait for the device to respring or reboot if the package forces this after the install. Step 5: Now, with the package installed, simply launch it, which should force the device to respring. In the words of the developer of the package, success will be defined by whether or not you see a “little spinner” on the screen. Of course, the very fact that you may have to go to these lengths just to get Substrate working as intended would probably suggest that it’s worth holding off on this jailbreak for a while. Or at least until it’s released in a stable state that allows every average user to successfully jailbreak without needing to have an advanced level of technical knowledge to troubleshoot any issues. atif when you click Substrate Fix (iOS 10) does your device re-springs? i don’t know the link sharing rules here so I can’t share the link. What if Cydia isn’t installed after successful jailbreak with yalu_mach portal? In my case I installed ipa file (yalu_mach portal beta 3) and jailbroken my iPhone 7, but there was no Cydia. Uninstall Mach-portal from your phone and rejailbreak with the updated cydia impactor and the beta 3 ipa. It takes a no of tries to get it right, hence the BETA tag. How did you manage to remove the Cydia app? after downloading the substrate tweak, I try to respring but my whole screen becomes black and i can’t do anything until i reboot it with the power and volume buttons. how do i respring then? This repo is no longer working. https://uploads.disquscdn.com/images/cf41e3e6e488c6536d7f79eb2315e307fbd523975dfe4ddb585d75c1dbe721d1.png https://uploads.disquscdn.c https://uploads.disquscdn.com/images/cf41e3e6e488c6536d7f79eb2315e307fbd523975dfe4ddb585d75c1dbe721d1.png https://uploads.disquscdn.com/images/b762cf1d1e3e60bab6bc8b73e6097f5e28d843b5f1b8884ff5c7f032a6d58880.png https://uploads.disquscdn.com/images/43581a72c25c836a4461df130dc4a59b235cce9970e821a2d606b17074544dae.png om/images/b762cf1d1e3e60bab6bc8b73e6097f5e28d843b5f1b8884ff5c7f032a6d58880.png This afternoon I updated a few things within cydia, and I was sent into safe mode. I restart and rejailbreak my iPhone 6s iOS 10.1 and rejailbreak with mach_portal. I press on the blue substrate fix app icon and I get the spinning ring like normal. I was sent into safe mode again so I deleted all the packages I update, which were iCleaner pro and YouTube++. Did the process again and still back to safe mode. 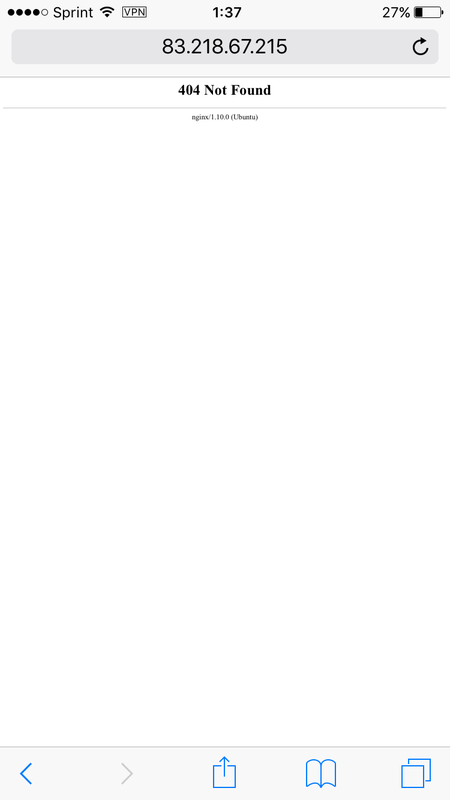 I opened cydia and after a refresh I received an http/1.1 404 error, but I didn’t know for what. I decided to remove the repo through iFile because it wasn’t delectable through cydia. 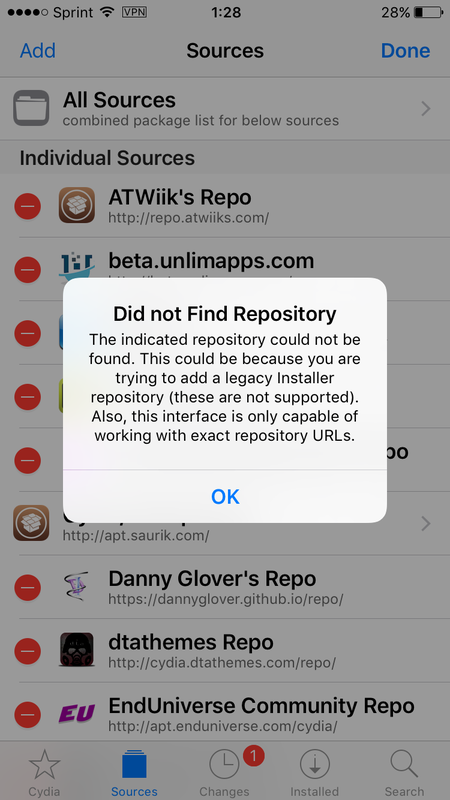 I tried adding the repo again “83.218.67.215/~ijapija00/cydia” -and I got a pop up message saying “Did not Find Repository” because it may be a legacy installer repository. I check ijapija00’s twitter and there’s no mention of it, and also when I try to visit the repo page online, I get a 404 error code.